So who am I? My name is Francis Lynch, and I am a computer software engineer for Wind River Systems, a software company based in Alameda, California, with local offices (where I work) in Downers Grove, Illinois (a suburb of Chicago). After graduating from the University of Illinois in 1972 with a B.S. in physics, I began graduate studies in atmospheric science but decided to leave the program in order to pursue a career in computer programming. 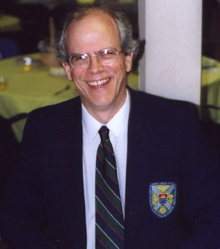 I co-founded Lattice, Inc., in 1982, and developed one of the first commercially successful C compilers for the IBM PC; I later worked as an independent consultant before joining Software Development Systems in 1997. When that company was acquired by Wind River in 1999, I became the beneficiary of a wonderful corporate policy that grants employees a five week paid sabbatical after five years of service. A fascination with remote subantarctic islands ultimately led me to use that sabbatical for a voyage of circumnavigation in 2002 that included 30 days at sea in the South Indian Ocean to visit some of these islands. A devoted aficionado of classical music and opera, I am an active amateur choral singer in both a volunteer chorus and my church choir, and have also appeared in the chorus of several Gilbert & Sullivan productions. I and my wife, Mary Jo Deysach (who elected not to accompany me on my voyage for various reasons but encouraged me in my plans to fulfill a life-long dream), live in Evanston, Illinois, along with numerous aquaria inhabited by tropical fish. Why the South Indian Ocean? Well, when I grew up here in the U.S., a feature of many classrooms was a map of the world, usually in the classic Mercator projection, with North and South America on the left, Europe, Africa, and Asia on the right, and the Pacific Ocean on the right. Somewhere along the way through my elementary and secondary education, I became fascinated with what appears (on such a map) to be one of the largest expanses of open ocean: the South Indian Ocean from South Africa to Australia. And I noticed that just about smack in the middle of this otherwise empty ocean was a fairly sizable archipelago with the curious name of Kerguelen. 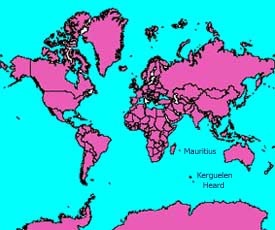 (On the map shown here, the larger smudge between South Africa and Australia is Kerguelen, and the smaller smudge just adjacent to the southeast is Heard Island.) These islands became a matter of some fascination for me, and I noticed to my chagrin that on many Mercator projections, the mapmaker's logo would sometimes be placed in the South Indian Ocean right on top of Kerguelen. When I was in college, I went so far as to check out of the stacks of the university library the only book I could find about Kerguelen: Deux Annees aux Iles de la Desolation (fortunately, I had four semesters of college French so that I could actually read it, albeit somewhat laboriously). I talked up Kerguelen with my friends and pointed out that it would be an ideal place to be should a nuclear war break out in the Northern Hemisphere, and when I went through the typical college-age fantasies of sailing a small yacht around the world, I dreamed of visiting the islands. But the exigencies of career and the gradual transition to something approximating maturity forced me to leave those dreams behind. Until, that is, Wind River and the five-week sabbatical made me start thinking about where I might go during those five weeks. 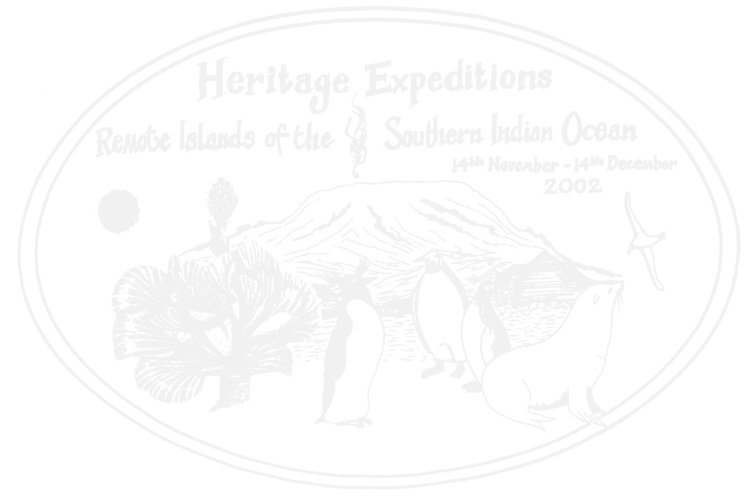 I wasn't thinking about Kerguelen but about New Zealand (another place that had fascinated me as a student) when I stumbled across the website for Heritage Expeditions. Their standard touring season included trips to some of the subantarctic islands south of New Zealand, and I found the idea quite appealing. Combining a visit to New Zealand with one of their shorter voyages would make for a very satisfying use of the time, so I returned to their website a week or so later to review the schedule. And that's when I saw the listing for the South Indian Ocean Expedition of 2002. Among its destinations: the archipelago of Kerguelen. It was to be a 30-day voyage, which would fit into my five-week time frame quite nicely. The cost made me swallow hard but hey, I'd been saving up for that big trip to somewhere, and what better somewhere could there be? There was only one catch: the voyage was scheduled for November 14 to December 14 of 2002 (and the description stated clearly that the voyage was only to be offered this once), and according to corporate policy, I was not eligible to take my sabbatical until January of 2003. You see, when Wind River acquired other companies, they generously gave their new employees credit for service to the original company as counting toward the five-year employment requirement for the sabbatical. But in order to prevent all of their newly acquired employees from taking their sabbaticals at once, there was a schedule for when they could be taken which depended on which company you had worked for. So even though my five-year anniversary of employment at SDS and Wind River was October 6, 2002, this schedule didn't permit me to take my sabbatical until 2003. Still, it seemed to me that November 2002 wasn't very far from January 2003, and I thought there might be a chance that the company would make an exception for me. Sure enough, after my local human resources person went to bat for me (a thousand thanks, LuAnn! ), I was given permission to take my sabbatical slightly ahead of schedule. And suddenly I could start planning for real: I was going to Kerguelen! There were more challenges to be met, however; the voyage started from the island of Mauritius (on the map above, it's the smudge just east of Madagascar in the Indian Ocean) and ended in Albany, Western Australia, which meant I had to get to Mauritius and then get home from Australia. Getting to and from those very remote endpoints (remote to someone from Chicago, Illinois) turned out to be quite challenging. But I had accumulated some mileage awards that I could use for portions of the trip, and I discovered that the best way to proceed was to fly east from Chicago to Paris to Mauritius, and then continue eastward from Australia back to North America via Singapore and Japan. So I would end up circumnavigating the earth as part of the trip (and be eligible for membership in the club whose logo is shown at left). And what traveler doesn't find the idea of going around the world appealing?